We have probably all dropped something on the floor and had it shatter into a million pieces. We stand there, not wanting to move and get cut on the broken glass. The next step is to get a broom and dustpan, sweep the shattered pieces up, and throw them away. 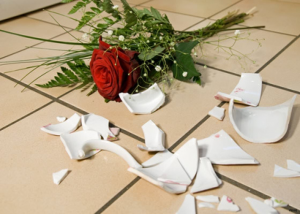 We might be just bothered by our clumsiness, or if the vase was an heirloom or very sentimental to us, we might shed a tear or feel really angry for awhile. We might try to glue the bigger pieces together or make smaller pieces and use them for another craft project (not me, because I am certainly “craft-impared”). This is a powerful analogy for the broken hearts I have ministered to for many years. I have seen the shattered lives that come from divorce, death of a loved one, loss from a fire or natural disasters. I have held countless sobbing children as I enfold them in my arms as they tell of the hurts in their hearts. I remember laying on the floor beside a sobbing woman whose husband walked away from her and their three children. I have held a boy under a table, while he shared how scared he was since his dad left. Under the table was the only place he felt safe. I have held a middle school boy while he sobbed until my shirt was wet with his tears. I have walked friends through their grief cycle, not knowing what to say sometimes, but always asking the Lord for guidance. Broken hearts. There is a lot of hurt in our world, but Jesus is the Answer to it all. We can share His loving embrace with them, even when we ourselves may be hurting. Look around today and see where you could be a blessing and extend His arms. ← Hooray For Being a Woman!